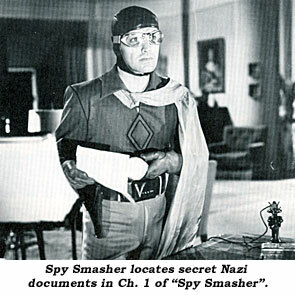 One of the top serial heroes of all time, especially as “Spy Smasher” in the 1942 Republic serial, handsome 6 ft. Kane Richmond was heralded by ace Republic badman Roy Barcroft as “The most pleasant man I ever worked with. He never uttered an unkind word about anybody and treated everyone with respect. 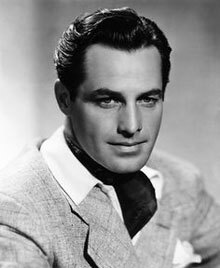 While Richmond never gained status in A movies, he became a big star in B-movies for some 20 years (1929-1948) including eight serials. Of Irish descent, Richmond was born Fred Bowditch in Minneapolis, MN on December 23, 1906. Coming from a rather poor family he worked at several odd jobs after high school graduation. His first encounter with show business was as a states’ rights film distributor in the Midwest circa 1928. After doing a little stage work he moved to California where he broke into films in 1929 in bit and extra roles. In 1930-‘31 he starred as Kane Halliday—aka Kid Roberts—in a series of 11 Universal ‘Leather Pusher’ shorts. Richmond married actress Marion Burns on May 22, 1933. 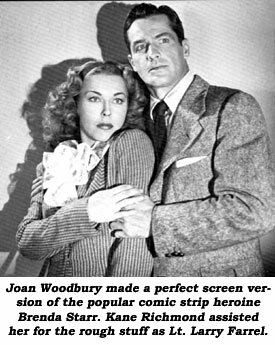 She was his co-star in “Devil Tiger” (aka “Man Eater” and “Three Against Death”). 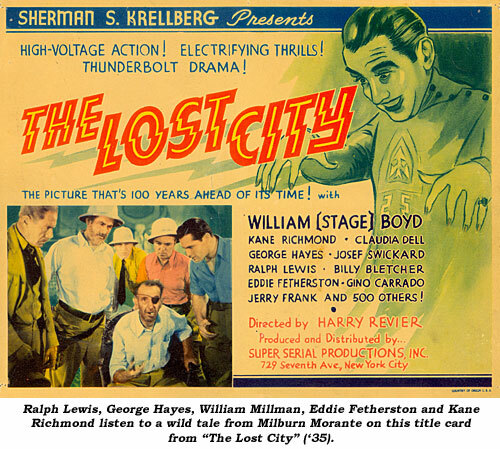 After several small B-film roles Richmond starred as electrical engineer Bruce Gordon in Sherman S. Krellberg’s independent 12 chapter serial “The Lost City” in 1935. In what has now become a cult classic serial, the plot has Bruce Gordon traveling as the inventor of a machine pinpointing Africa as the source of several world-threatening atmospherical catastrophes. Leading an expedition into the jungle, he soon discovers mad scientist Zolok (William “Stage” Boyd) as the ruler of a lost city and his Magnetic Mountain as the cause of all the disasters. During the course of the bizarre 12 chapters our hero found himself battling tribal natives, a crooked slave trader (George Hayes) and Zolok’s giant, living dead men as he tried valiantly to rescue Dr. Manyus (Josef Swickard) and his daughter Natcha (Claudia Dell) from the clutches of Zolok. 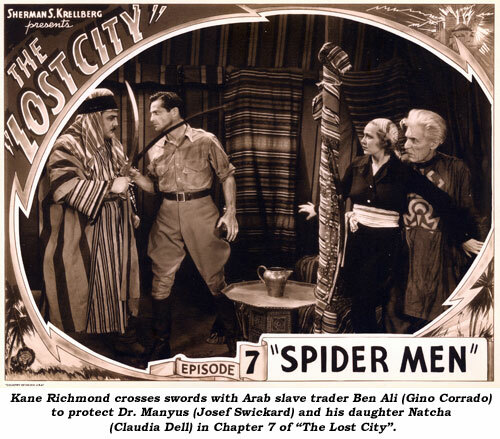 Today, “The Lost City” is regarded as one of the worst serials ever made due to the wildly over-the-top histrionics of the actors apparently insisted on by director Harry Reiver and the politically incorrect plot in which Zolok turns black tribesmen into white ones. Nevertheless, taken for the “campy” serial that it is with all the above plus spider men, midgets and Kenneth Strickfadden’s incredible electrical machines, it is a quite madly enjoyable serial romp. 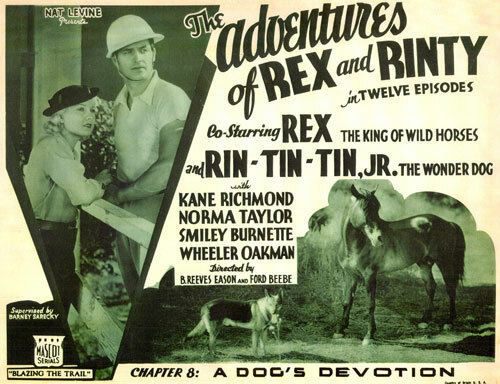 Also in 1935 Richmond signed with Mascot for “The Adventures of Rex and Rinty”, which was basically a showcase for Rex, the King of Wild Horses, and Rin Tin Tin Jr. Richmond played polo champion Frank Bradley who is trying to return the sacred horse Rex, who has been stolen, to his native island of Sujan. Ruthless tycoon Harry Woods was out to steal Rex at any cost. 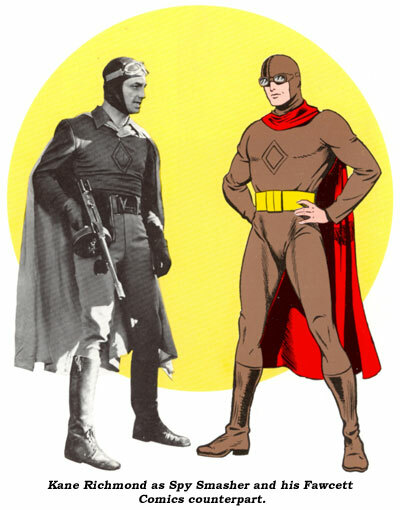 It was almost three years before Richmond appeared in another serial, and it was only as a supporting character, a Martian stratosled captain serving Azura, Queen of Mars, in “Flash Gordon’s Trip to Mars”, released in 1938. From ‘38 to ‘41 Richmond starred or co-starred in 26 films such as “Tail Spin”, “Return of the Cisco Kid”, “Charlie Chan in Reno”, “The Escape”, “Charlie Chan in Panama”, “Mountain Moonlight”, “Great Guns” and “Riders of the Purple Sage”. 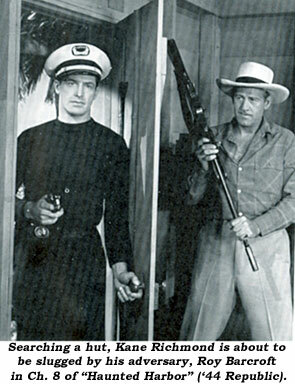 Two years later Kane was back at Republic for “Haunted Harbor” (‘44), easily his second best serial outing. Set on the “haunted” jungle island of Pulanti, Richmond is schooner captain Jim Marsden accused of a murder he didn’t commit. Trying to clear his name, he’s up against Roy Barcroft’s gang who are trying to scare people away from a cache of sunken gold with a mechanical, smoke-breathing sea serpent lurking beneath “Haunted Harbor”. Aiding Richmond are Kay Aldridge, Marshall Reed and Clancy Cooper. 9, 10, 11, 12. 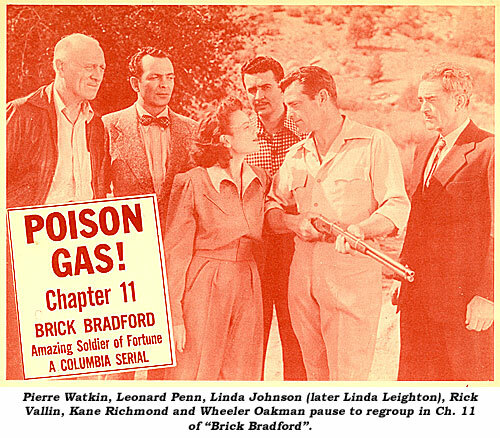 Others in the cast were Ernie Adams, Billy Benedict, Jack Ingram and Syd Saylor involved in a payroll murder and a gangland murder. 1945 also saw Richmond at Columbia for his next serial, “Jungle Raiders”. War vet Bob Moore, his father (John Elliott) and pal Joe Riley (Eddie Quillan) search for a hidden Arzec village that promises medical miracle cures…and precious jewels. They all become entangled in the schemes of greedy trading post owner Charles King and his evil cohort Cora Bell (Veda Ann Borg) who are after the treasure guarded over by the lost Arzac tribe who are governed by high priestess Zara (Carol Hughes), keeper of the Arzec god Rana, and scheming tribal witch doctor Ted Adams. Richmond and Quillan must also aid pretty Janet Shaw in her search for her father (Budd Buster) who is being held in a basement dungeon by Charlie King who believes her father knows the secret entrance to the Arzec village. 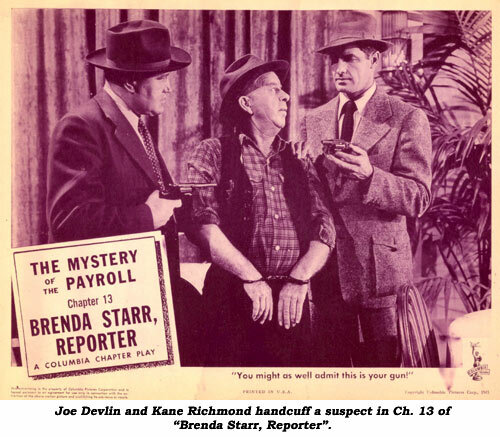 1946 saw Richmond star as The Shadow in three Monogram mysteries along with a handful of other B films before returning to Columbia for his final Sam Katzman cliffhanger, “Brick Bradford” in ‘47. 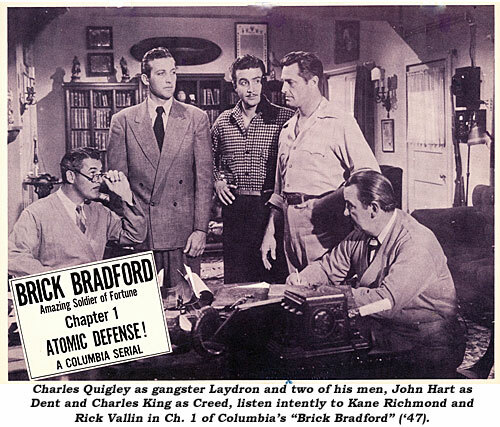 Richmond was, naturally, comic-strip adventurer Brick Bradford who, along with his pals Sandy (Rick Vallin), June Saunders (Linda Johnson) and Professor Salisbury (Pierre Watkin) on behalf of the United Nations, attempt to protect the dangerous Interceptor Ray, an anti-guided missile weapon perfected by eminent scientist Dr. Tymak (John Merton), from falling into the nefarious hands of gangster Laydron (Charles Quigley). One of Dr. Tymak’s more spectacular inventions is a crystal door which enables Brick and his friends to be transported to the Moon where they encounter Queen Khana (Carol Forman) and Prime Minister Zuntar (Robert Barron) who are trying to overthrow the evil rulers of the Moon. Brick and his friends also go time-traveling via The Time Top where they are captured by Lulah (Noel Neill) and her 18th century Central America natives. Wild, yes, but filled with great cliffhanger adventure and tongue-in-cheek antics of Rick Vallin. At 41, after “Brick Bradford” Richmond only made one more film, “Stage Struck” (‘48) before retiring from the film industry to become part owner and sales manager of the dress company Junior Time of California. He was also a member of Pacific Coast Travelers, a fashion organization. Living in Newport Beach with Marion, the 66 year old serial hero fell ill from liver cancer and died in Corona del Mar on March 22, 1973. In Ch. 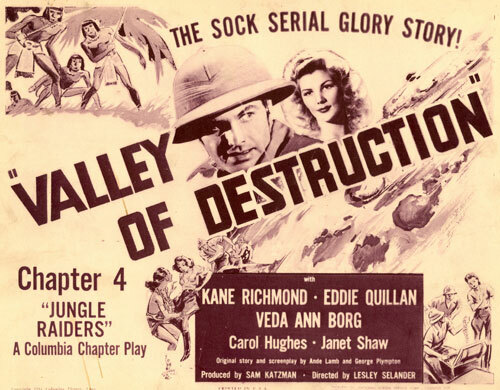 14 of “Jungle Raiders”, Kane Richmond goes into the Valley of Fire without his gun. Then he has it on. Then he doesn’t. 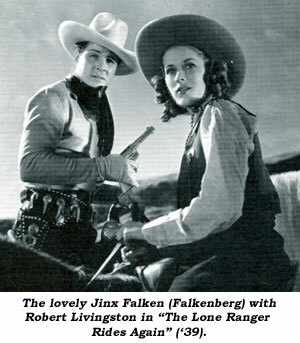 Jinx Falkenberg, Robert Livingston’s co-star in “The Lone Ranger Rides Again” (‘39) serial (billed as Jinx Falken) was the daughter of a mining engineer. Jinx was born in Barcelona, Spain on January 21, 1919. Her mother gave her the name Jinx thinking it would bring her good fortune—which it did. After her family moved back to L.A., Jinx was spotted by a Warner Bros. talent scout. Fluent in Spanish, Jinx was cast first in WB’s Spanish language films. Considered one of the most beautiful women in America, a lucrative modeling career developed in the late ‘30s-early ‘40s. She met her husband, radio/TV producer Tex McCrary, in the ‘40s, they were married in ‘45 and pioneered the morning radio talk show format in ‘46 with “Hi Jinx” on NY’s WEAF. By ‘47, the pair moved to TV with “At Home” on NBC (Sundays). Later in life she became a major fund raiser for the GOP. Jinx died August 27, 2003 at 84.